An update of one of television’s most popular and long-running game shows, Password, this series is hosted by Regis Philbin. In the elimination round, two teams — each made up of one celebrity and one contestant — compete to guess “passwords.” One person on each team has the passwords and tries to help their partner guess them by using single word hints. The clue-giving and guessing roles switch after each 30-second round and, halfway through the game, the celebrities swap partners. After four rounds, the contestant with the most points moves on to the bonus round. The celebrity which helped him/her earn the most points becomes their partner. The bonus round works in a similar way as the preliminary rounds. There are six levels in the bonus round, with cash prizes starting at $10,000 and rising to $1,000,000. The contestant or celebrity must guess five passwords in 90 seconds. As the prize level rises, there are fewer words given and therefore fewer opportunities to pass a difficult word. Contestants can quit at any level and take their winnings. If they try to go to higher levels and do not complete the round, they lose their winnings. However, once they reach the $25,000 level, they are guaranteed to win that much. 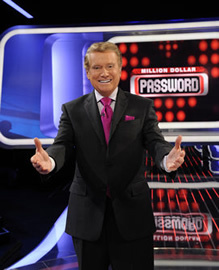 Million Dollar Password: Regis Philbin Series Returning; Will It Be Back Next Season? Million Dollar Password: CBS Pulls Game Show, Will It Be Back? Will Regis Philbin? Million Dollar Password: A Big Enough Winner for CBS? I am a teacher who plays this game all the time with my students. I work with special Ed students at an alternative high school. Most of our kids are from a tough city, Lawrence Massacusetts. It would be unbelievable to those kids and my family to find a way on the show. The Process should be easier.